And, here is the big list of overall brand reliability. Wow. Mitsubishi didn’t even make the list a reliable vehicles. I’d still trust a Mitsubishi over a Dodge or a Kia any day. The dash was one of the things I loved the most in my Yaris. To each his own I guess. They did end up changing them to the "normal" style. I think it might have been around the 2012 model year. Plus the Yaris doesnt really get that great of mileage. Someone mentioned their trucks being overpriced. The Tacoma is a bit spendy and they have had some bugs with their new tacoma but the Tundra is THE deal in full size trucks now. Its had the same bulletproof drivetrain since 2007 and is due for a big refresh but you can score a super reliable truck for a lot less than the other trucks with all their unnecessary bells and whistles. The tundra demolishes all others in reliability and doesnt have all the dumb stuff that the others do, just a good old V8, solid transmission, and proven drivetrain. Plenty of Tundras over 500k miles with no massive repairs. And of course the 1mil mile 2007 Tundra. Original engine went the 1mil miles easily. and orig trans went to 779k and that truck was used as a hotshot delivery truck for the oil industry. Toyota bought it back and took it all apart and said the engine was still in spec after 1 million miles. I have a 2016 Tundra and it's been awesome. You have to understand there is a "chicken tax" that is a 25% tariff on light duty trucks. Its cheaper to ship the body then build the chassis in the US, but then it would be subject to a 4% tariff. I would prefer to get a Hilux if I could or a Mitsubishi L200 truck. But so far all I had with my Corolla has been problems. Bad grounds, alternator died at 70k, and I had two sets of warped rotors on it. Such a headache. The Tundra and Taco are built in the United States. Yep. The "Chicken Tax" is one of the reasons foreign manufacturers first started putting factories in the US. If Mitsubishi is smart they will at least start offering a badge-engineered version of Mama Nissan's Frontier. Yeah Toyota used to bring the first 4x4 pickups over without the box from Japan. My old 82 was 10,800.00 usd in 82! That was more than a full size american truck back then. Yeah Toyota used to bring the first 4x4 pickups over without the box from Japan. It's the same sort of work-around that Subaru used when they brought over the BRAT. They cleverly bolted rear-facing jump seats into the bed when they imported them. This allowed what was a little pickup truck to be classified as a 'passenger vehicle' for tax purposes. Adding $50-$100 worth of seats saved Subaru thousands of dollars in taxes on each BRAT they sent here. The seats were often removed by the Subaru dealership as soon as the BRATs arrived. 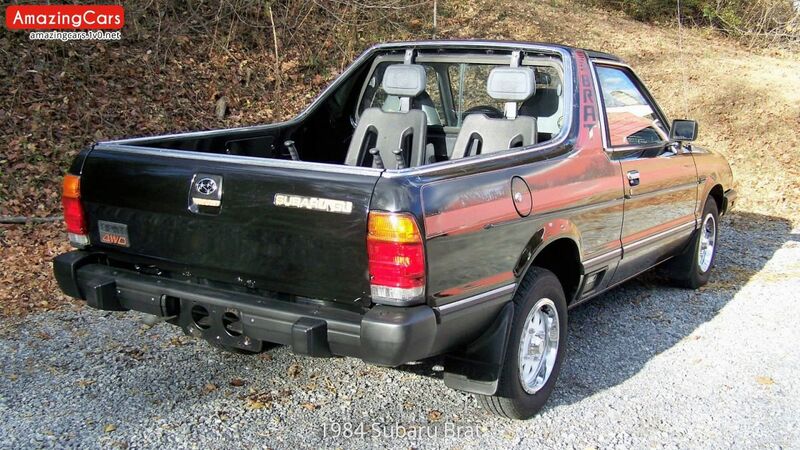 When I was in junior high I remember my buddy's dad had a Nissan 720 4x4 with those Subie jump seats bolted into the bed. There are LOTS of weird ways to work around that tax.